Navigation: Home » Personal Finance » Hedge Your Gas Prices! I know, to hedge gas prices with ETFs is a topic we here at DQYDJ have covered before… specifically way back on July 2nd, 2009 when gas was averaging $2.63 nationally. Today we’re going to give you the opportunity to calculate what it would take for you to hedge your gas prices with our nifty gas price hedging calculator! Hedge Gas Prices with ETFs – Your Tank (and Wallet) Will Thank You! As before, our hedging depends on the performance of the ETF UGA… which is tied to the performance of gasoline futures contracts. Change the price below to whatever UGA is trading at now and tweak some of the assumptions, and DQYDJ will automatically calculate exactly what you’ll need to buy in order to lock your gas prices in at whatever they are today. Does UGA track gasoline perfectly? No… not exactly; price increases may be absorbed due to fierce competition, while quick falls might not appear as quickly as the pump itself. You also would have had to pay some tax on your gains if you held UGA outside a retirement account, so the tracking isn’t that bad. Maybe not; there are a lot of moving parts here, and not just in your engine. You might drive more or less this year, you might buy a new car, the ETF might not perfectly track the price of gasoline, your state might change the mixing rules, your state or the Feds might increase gas taxes… and so on and so forth. Regardless, it’s safe to say that it is at least fun to think about the possibilities, even if getting an exactly hedge is impractical. And always, your investing is up to you… but here’s how you can try to hedge your gas prices if you’re interested! 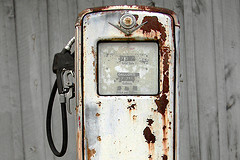 I believe the gas prices are going to continue to rise, close to $4 per gallon. First, there is the inflation caused by easing and other Fed boondoggles. Second, the unrest in the middle east provides a convenient excuse to jack up oil prices. Next, we’ll start to hear about refinery maintenance shut-downs and other scams. Then, the hedge funds and other speculators will start bidding up the commodity prices. It’s a good thing I have a small car and a short commute. But, I’m still looking into purchasing an electric car.